While up at my cottage in Collingwood, I always wish there were some better restaurants to choose from. Don’t get me wrong, there are a few hidden gems, but it was just needing something more. I am thrilled to annouce that a new smokehouse called, The Smoke has recently opened up. When my boyfriend and I heard this great news, we immediately made a reservation. The modern, large, open space was quite refreshing to see in this small town. As we walked in, the smoky, BBQ smell filled the air and I was ready to dig in. Each table is set with 4 bottles of homemade BBQ sauces; Carolina Mustard Sauce, Smokey Sweet BBQ Sauce, Sweet Tangy BBQ Sauce, and Hot Vinegar Sauce. 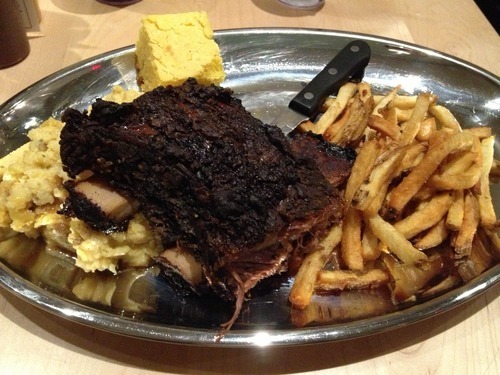 The special of the night was Smoked Beef Short Rib, Garlic Mashed Potatoes, Au Jus, Cornbread & 1 Side (we chose fries). Seriously, these ribs were insane. Like out of this world. Jonty and I could not believe how juicy, tasty and literally fall off the bone they were. It’s safe to say these were the best beef ribs we have ever eaten. Crazy, I know. Little old Collingwood has some of the best BBQ food. I love cornbread, and this one did not dissapoint, along with the mashed potatoes and fries. Everything was just utterly amazing. The only catch slash dissapointing thing about this place is that beef ribs are not a staple on their menu. They only have them every so often and not too many portions. 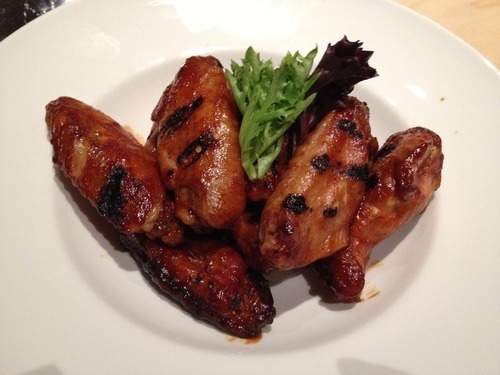 We also ordered a pound of smoked BBQ chicken wings that are smoked for two hours and tossed in their homemade BBQ sauce. They were sweet, smokey and juicy, just as they should be. 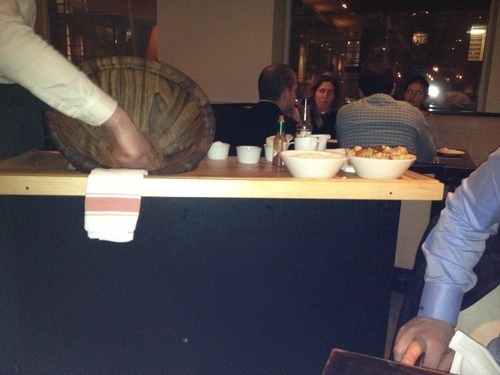 This restaurant is worth some serious mention and praise. It is also worth the trip to Collingwood. Jonty and I are going up to the cottage this weekend and already have reservations! This week was Jonty’s birthday and I really wanted to take him somewhere special for dinner. While he isn’t such a fan of surprises, I made sure to keep the restaurant a secret until the very last second. 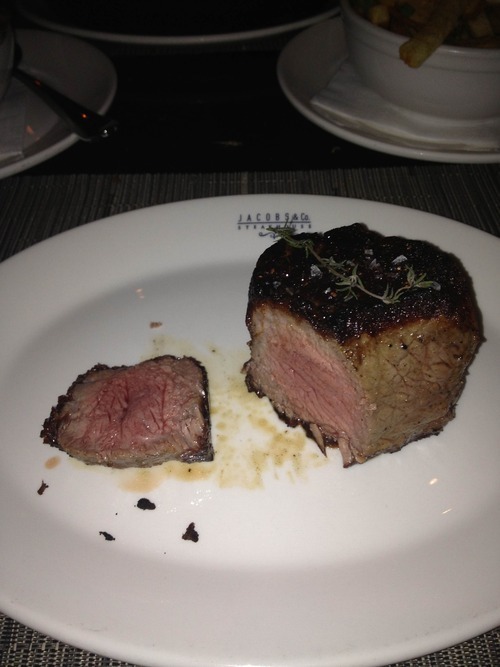 I thought long and hard about where to go, and ultimately decided on Jacobs & Co steakhouse. It is a classic, well-known dining experience and I figured since neither of us had been, it was time we check it off our list. The grand, and might I add heated outdoor entrance was an amazing, welcoming touch. As soon as we entered, we were greeted by the friendly hostesses and an older gentleman, the maitre d kindly directed us to our seats in the classy, polished upstairs dining room. He pointed out the dry-aged showcase, filled with each type of meat, encased in glass, all labeled perfectly. Our attentive, friendly, and knowledgeable waiter approached us for some drinks, where I chose a glass of white wine, and Jonty opted for a glass of Johnny Walker black. He then proceeded to go into very much detail about the meat, the cuts, the aging process, and just about everything you could know about the steaks. 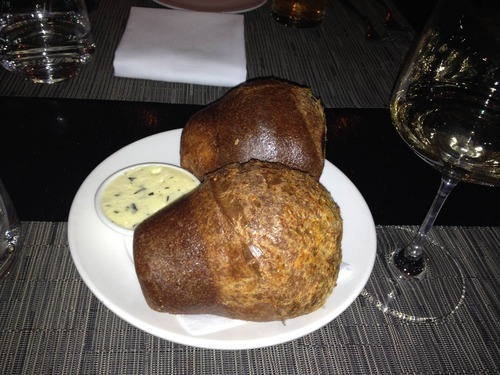 First our waiter brought over freshly baked popovers. Crispy on the outside, and fluffy yet hollow on the outside. I couldn’t wait to slather it with the garlic butter, even if it meant burning my mouth a couple times. It was totally worth it. 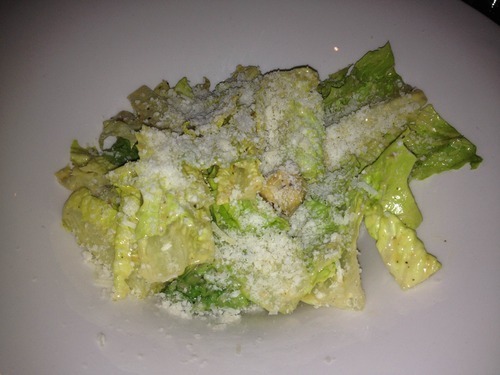 Jacobs is known for their tableside caesar salad which is literally made in a cart that they bring to your table. We ordered this and enjoyed watching each fresh ingredient go into the mix, and enjoyed eating it even more. The salad was not your typical overly creamy dressing, but it still lived up to its hype, with the perfect amount of garlic and zing. Before the steaks arrived, a few sauces and salts were delivered to accompany the meat. The sauces included an Argentinian Chimichuri sauce, blue cheese with bacon (YUCK, I dislike blue cheese and don’t eat bacon-but I’m sure it was delish), and a Ponzu citrus ginger soy sauce. As for the salts, there was regular coarse sea salt, volcano smokey salt, and charcoal salt. With a huge variety to choose from, and some advice from our waiter, we both chose a USDA Prime Black Angus California cut striploin. As it arrived in a cast iron pan, we both cut into a perfectly cooked medium piece of steak. It was juicy, and buttery in a way, and we both enjoyed every last bite. 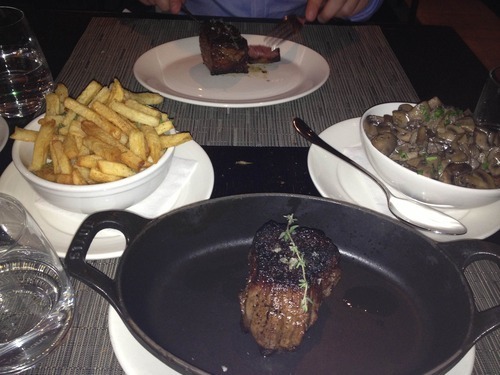 For sides, we went with mixed sauteed mushrooms and duck fat french fries with tarragon. The variety of mushrooms was a nice light touch to the meal, while the duck fat fries were interesting. The fries themselves were quite delicious, but I felt that the terragon was a little overpowering for my liking. I had previously arranged that whichever dessert we chose would be delivered with a candle for Jonty’s birthday. Since he loves cheesecake, this was an easy decision. It arrived with a candle, “Happy Birthday” written in chocolate, and smothered in strawberries and strawberry sauce. It was incredibly smooth, creamy and mouthwatering. 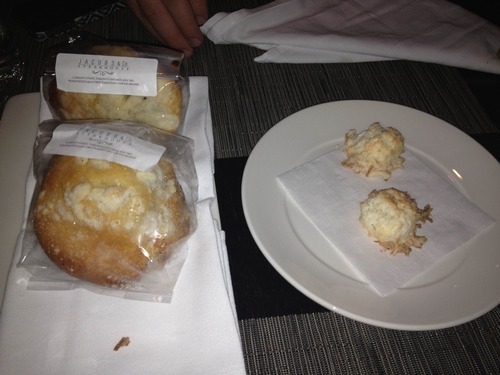 Just when we thought our dining experience had come to an end, the waiter brought over a plate of 2 macaroons and wrapped up muffins for breakfast the next day. I absolutely LOVED this extra little touch. It’s little things like this that make me so very happy! We both enjoyed the muffins the next day and couldn’t believe how buttery, chocolately and plain amazing they were. Probably one of the best muffins we have ever had! 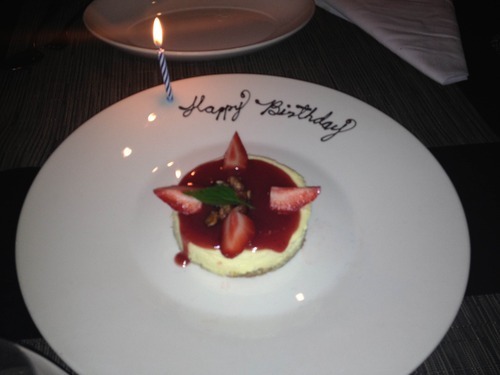 Jacobs & Co is a great place for special occasions or if you are just looking for some good food, service and ambiance!